1 total = 9 total is assigned the value of 9. 2 total += 10 total is assigned the value of itself plus 10. This is the “shortcut” operator for addition. It is easier to type than “total = total + 10”. total now has the value of 19. 3 total -= 10 total is assigned the value of itself minus 10. This is the shortcut operator for subtraction. total now has the value of 9. 4 total *= 3 total is assigned the value of itself multiplied by 3. 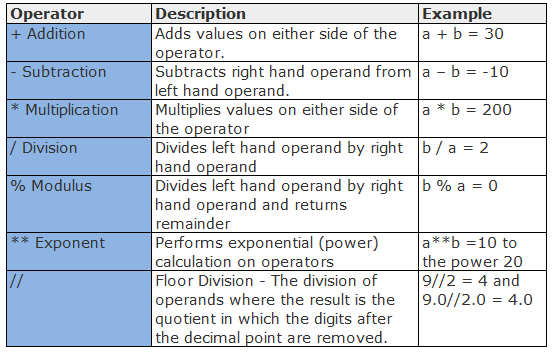 This is the shortcut operator for multiplication. total now has the value of 27. 5 total /= 2 total is assigned the value of itself divided by 2. This is the shortcut operator for division. total now has the value of 13, not 13.5, because / returns the integer portion of the division. 8 total /= 2 total is assigned the value of itself divided by 2, preceded by an import from the __future__ module. What this line says is that in a future release of Python (Python 3000, to be exact), division will include the fractional portion of the result. 9 total = ’9’ total is assigned the value of the character ’9’. This ’9’ is not an integer, but a string data type. Even though it looks the same as the integer 9, the program cannot use it for arithmetic calculations. 10 total += 10 total, with a string value of ’9’ is assigned the value of itself plus the integer 10. 11 total = int(total) total is converted to an integer. This only works if the string can convert to an integer. total now has the value of the integer 9. 12 total += .5 total is assigned the value of itself plus a floating point number. 13 total -= .5 total is assigned the value of itself minus a floating point number. 14 total = int(total) total is converted to an integer.